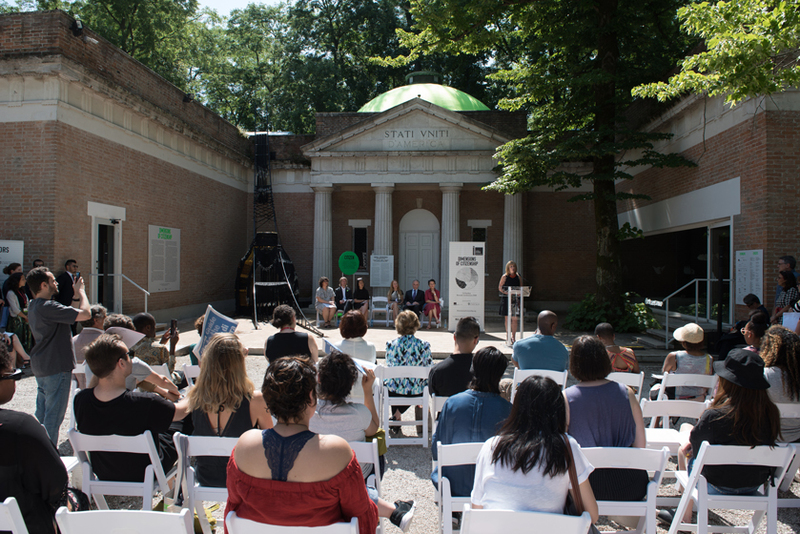 VENICE, ITALY, May 24, 2018—For the 16th International Architecture Exhibition of La Biennale di Venezia, the US Pavilion, commissioned by the School of the Art Institute of Chicago (SAIC) and the University of Chicago (UChicago) on behalf of the US Department of State’s Bureau of Educational and Cultural Affairs, presents Dimensions of Citizenship. The exhibition challenges architects and designers to envision what it means to be a citizen today, as critical contemporary issues expand conventional notions of citizenship. The US Pavilion curators Niall Atkinson, Associate Professor in the Department of Art History and the College at UChicago; Ann Lui, Assistant Professor at SAIC; Mimi Zeiger, an independent critic, editor, curator, and educator; and associate curator Iker Gil, Lecturer at SAIC invited seven transdisciplinary teams to represent the United States at the Biennale Architettura 2018. The teams, which include architects, landscape architects, theorists, and artists, have each been asked to grapple with the potential meanings and architectural implications of citizenship at a different scale. Their works use design to unpack contemporary social, political, economic, and environmental issues, including the meaning of home, the right to public space, the uses of civic monuments, the dynamics of borderlands, and the conditions of global migration. What becomes clear in each immersive installation is the need for architecture to respond to and shape spaces of citizenship at all scales, today and in the future. • Citizen | Amanda Williams + Andres L. Hernandez, in collaboration with Shani Crowe . Installed in the US Pavilion’s courtyard, Thrival Geographies (In My Mind I See a Line) explores issues of race, fugitivity, and public space. Made of steel and hand-braided cord, it illustrates ideas of Black spatial practice and points toward a liberatory architecture inclusive of all citizens. • Civitas |Studio Gang. Memphis Landing, a cobblestone-paved landing on the Mississippi River that served as the city’s historic port, provides the basis for Stone Stories. As part of a larger design process, the project transports hundreds of the site’s cobblestones to Venice to explore how the Landing could become a site of civic memory that represents many citizen voices, past and present. • Region | SCAPE. Ecological Citizens uses the Venetian Lagoon as a globally significant case study of a region under threat and argues for the politics and practice of ecological activism to generate new regional landscapes of the future. The intertidal architectural artifacts on view such as sediment fences and biodegradable coir logs represent bio-reclamation tools for citizen-led responses to climate change. • Nation | Estudio Teddy Cruz + Fonna Forman. Challenging the way we think about national boundaries, MEXUS: A Geography of Interdependence presents a mural-sized visualization of the watersheds, indigenous lands, ecological corridors, and migratory patterns that straddle the political border between Mexico and the United States, suggesting an alternative transborder commons based not on physical division but shared assets and cooperative opportunities. • Globe | Diller Scofidio + Renfro, Laura Kurgan, Robert Gerard Pietrusko with Columbia Center for Spatial Research. In Plain Sight reveals anomalies and the consequent perils at the core of this binary world view. Visitors are shown places in the world with many people and no lights, and those with bright lights and no people, and are suspended between day and night and light and darkness exposed to the political and social realities of being invisible in plain sight. • Network | Keller Easterling with MANY. The MANY platform proposes to facilitate migration through an exchange of needs. Favoring cosmopolitan mobility over citizenship, it more robustly networks short-term visas and suggests that cities can bargain with their underexploited spaces to attract a changing influx of talent and resources matching their needs with the needs of mobile people to generate mutual benefits. • Cosmos | Design Earth. Cosmorama presents three “geo-stories”—Mining the Sky, Planetary Ark, and Pacific Cemetery that speculate on the legal geography of citizenship and ask how we should reckon with the epic and frontier narratives that have fueled space exploration and projects for off-planet settlement. Dimensionsofcitizenship.org, the dedicated digital platform created for the 2018 US Pavilion, is a resource for both Biennale Architettura 2018 visitors and a broader general public. It acts as a hub for participation and dialogues from diverse global voices, and acts as a unique resource about the exhibition as well as topics related to citizenship. Dimensionsofcitizenship.org also features Dimensions of Citizenship public programming event calendar, expanded content from each participant, in-depth essays by renowned scholars on citizenship across the seven scales, and enable people to seek new ideas, stories, and engagement from a diversity of voices. The series "Form N-X00: New Forms for Citizenship” developed by the curatorial team expands the notion of citizenship with contributions from invited guests, who live and work around the world, that respond to contemporary understandings of citizenship. Representing the commissioners of the 2018 US Pavilion are: Bill Brown, Senior Advisor to the Provost for Arts and Karla Scherer Distinguished Service Professor in American Culture in the Departments of English, Visual Arts, and the College, UChicago; Jonathan Solomon, Associate Professor and Director of the Department of Architecture, Interior Architecture, and Designed Objects, SAIC; Bill Michel, Executive Director of UChicago Arts and the Reva and David Logan Center for the Arts, Office of the Provost, The University of Chicago; and Paul Coffey, Vice Provost and Dean of Community Engagement, Office of the Provost, SAIC. The exhibition and graphic designer is Inventory Form & Content. The editorial partner is e-flux Architecture and the media sponsor is Architectural Record. The US Pavilion is funded in part by the US Department of State’s Bureau of Educational and Cultural Affairs (ECA), which builds relations between people of the United States and the people of other countries through academic, cultural, sports, and professional exchange programs, as well as public-private partnerships. Chicago magazine conducted a Q&A session with AIADO assistant professor Ann Lui, for her role as a curator for the US Pavilion at the Venice Architecture Biennale. Curbed reviewed the US Pavilion's exhibition, Dimensions of Citizenship, at the Venice Architectural Biennale calling it "a masterstroke." The US Pavilion's exhibition Dimensions of Citizenship was included in Domus' list of "5 pavilions not to be missed."